My Christmas recommendation for this week is the lovely Stella’s Christmas Wish by Edinburgh based author Kate Blackadder. From the very beginning of this novel I was really intrigued by Stella and her family. She is at work in her London office just before Christmas when she receives a phone call to say her beloved grandmother, Alice, who brought her up, has had a bad fall at home in Melrose in the Scottish Borders and is in hospital. She quickly makes arrangements to get the train north. In the course of the first few pages the reader finds out that Stella’s sister Maddie, who lives in Edinburgh, has mysteriously travelled at very short notice to Australia, not even telling Stella she was going. Stella has very mixed feelings about heading home as she is keen to avoid ex-Scotland rugby player and ex-boyfriend Ross – another mystery: why did she leave for London so suddenly when they were so much in love? And what does everyone else seem to know about why Alice was so keen for Maddie to go to Australia? The two settings of the Borders and Edinburgh worked well for me. Kate Blackadder captured perfectly Edinburgh at Christmas time with the excitement of the Christmas markets, the big wheel by the Scott Monument and the busy shops. I had a little chuckle to myself when one of the characters was complaining that you never knew where you could drive these days as streets had changed to one way or bus or tram only. As a driver who rarely ventures into the centre of town for this very reason, this little detail was spot on! In contrast, Melrose seemed a much more tranquil yet still vibrant Borders town with the beauty of the surrounding hills and countryside wonderfully depicted. At the heart of this book are the different kinds of relationships between the characters. We read about the breakdown in the relationship between Stella and Ross which seems so confusing when they so clearly still love each other. There is a close relationship between Stella and her grandmother, despite the distance between them. Stella has always been very close to Ross’s mother and grandfather, having known them most of her life, and that kind of difficult situation where a relationship has broken down is also explored. Without giving too much away there is also an unexpected look at love in later life. All these variations of love are sensitively and convincingly portrayed. 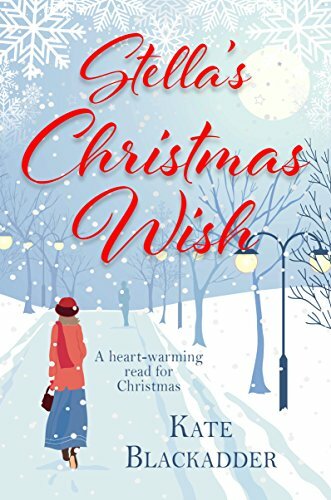 Stella’s Christmas Wish is a delightful, warm-hearted Christmas read which I thoroughly enjoyed. It’s a relatively short read at the e-book equivalent of around 180 pages but there is certainly more than enough going on to keep you contentedly reading for a few hours, preferably by the fire on what is, as I write this, a frosty day. Six days before Christmas, Stella could never have anticipated the impact on her life when the phone rings in her London office. The phone call is from a friend of the family informing Stella that her grandmother has been hurt in a fall at her home in the Scottish borders and is in hospital. Torn between her responsibilities at work and the need to be with her grandmother she decides she must return to Scotland immediately. Thank you Anne – and thank you Joanne for a lovely review. Do hope you enjoy it, Anne. I’ve had a few Christmas books to read Anne so doing one a week. It’s certainly getting me in the mood! Oh you’ll love this then Joanne! Hope it’s a good trip down memory lane for you, Jo. Thank you for commenting.